The Earth, also called the Human World (人間界, Ningen Sekai), is a planet created along the stars and planets. It is home to millions of species of life, including humans. It is the main setting for every Yu-Gi-Oh! series, and all of the protagonists call Earth home. It is revealed in Yu-Gi-Oh! ARC-V that there are many parallel Earths spread across the multiverse. One alternate Earth resides for each method of Summoning introduced except the Pendulum Summon, and the Duelists who survive on those alternate Earths utilize the Summoning method associated with their dimensions. The Earth appears a low-energy world enabling a proliferation of organisms for plants and animals. The modern English noun earth developed from Middle English erthe personified as a goddess in Germanic paganism (appearing as Jörð in Norse mythology, mother of the god Thor). In general English usage, the name earth can be capitalized or spelled in lowercase interchangeably, either when used absolutely or prefixed with "the" (i.e. "Earth", "the Earth", "earth", or "the earth"). Many deliberately spell the name of the planet with a capital, both as "Earth" or "the Earth". Everything was created from darkness. When the universe began it split into darkness and light. As the light vanished soon, the darkness filled the universe and created everything in the world, including life. First one card was born, the front represented the Earth also designated as the Human World and the Duel Monsters Spirit World, while the darkness was the World of Darkness. Eventually, the stars and planets were born, including the Earth, where the humans stood at the top of all creations. Inevitably, the humans discovered the Duel Monsters, therefore, it became a touchstone to test their souls. 10,000 years before the start of the series, a perfect city known as Atlantis existed isolating it from the rest of the world. It was inhabited by Duel Monster Spirits and humans, who coexisted peacefully. They were said to have known nothing of violence. Soon after a monarch Dartz came to power, he tried to destroy the earth with an army of Orichalcos Soldiers, but his father, Ironheart, opposed him. He went to a temple and requested the assistance of the Duel Monster Spirits, which they agreed to lend. After a battle known as the Battle of the Stone Wasteland, The Great Leviathan was defeated and sealed away by Ironheart's army. Before his death, Ironheart sealed the doors to the Duel Monsters Spirit World, leaving behind their spirits scattered across all the world. Some were left in the Egyptian pyramids, the Greek temples, the Aztec pyramids, the Egyptian mastabas. Dartz survived, and began gathering souls to revive The Great Leviathan to destroy and reconstruct both the Earth and the Duel Monsters Spirit World in his own image. 3000 years later in the present age, a young boy named Yugi Muto solves the Millennium Puzzle and is possessed by the spirit of the Nameless Pharaoh, who lost all of his memories from his old life. As a thank you to the spirit who saved him from bullies and gave him new friends, Yugi decided to help the spirit out and find a way to recover his lost memories and send him to the after life. Ten years later, Yu-Gi-Oh! GX follows a young boy named Jaden Yuki who, along with his friends, attends Duel Academy, a special institute founded by Seto Kaiba, in the hopes of becoming the next King of Games. Using his "Elemental Hero" Deck Jaden faces various challenges against other students, teachers and other mysterious beings. Some time after the events of Yu-Gi-Oh! GX, the earth is futuristic in the City of New Domino. The game of Duel Monsters has changed; a new addition has been introduced to the future of Dueling as seen in 5D's: "Turbo Duels" which are played in giant stadiums, and Duelists ride motorcycles with built-in Duel equipment known as "Duel Runners". This series focuses around an aspiring Duelist from Satellite named Yusei Fudo. It is revealed that before becoming Barians, the Seven Barian Emperors were humans once in their past lives, with each of their past being connected to each ancient ruin the Mythyrian "Numbers" were hidden in and their protectors. Don Thousand and Astral battling. Emissaries from Astral World and Barian World, Astral and Don Thousand, fought against each other on Earth. According to Jinlon, two divine lights were fighting in the sky far, far away. The battle lasted for hundreds of days. Rains of fire poured down on the grounds as lightning ripped through the very Earth. Then those two lights collided and vanished. Astral ultimately emerging victorious, sealing Thousand in the Barian Sea, but brought chaos to the Earth in the process. The Earth was futuristic in another city in the near future, Heartland City, kids and adults enjoy Augmented Reality Duels. The hero is Yuma Tsukumo. At a beginner level, he's a champion at absolutely losing. Due to a chain of events, Yuma ends up challenging the number one delinquent at his school, Reginald Kastle. His destiny is changed by a bizarre door he's seen in his dreams. When Yuma unlocks this sealed door, countless lights fly from it and scattering all over the Earth. And when Yuma comes to, he sees the mysterious entity, Astral, who came from a parallel dimension, standing before him. 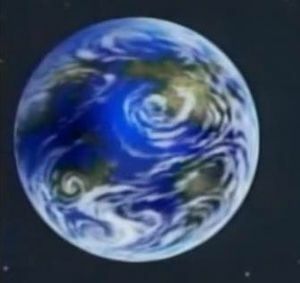 Astral World and another world sent a wave of energy that collided with the Earth where Yuma Tsukumo and Astral currently are, causing time to temporarily stop and a sun from each world to appear. Dr. Faker explained that it is because the worlds are getting closer. Dr. Faker also said that something bad will happen soon because of this. After Number 96 mastered the power of Chaos, he opens a portal to this world, Barian World and Astral World, then he launches powerful attacks into the three worlds and an abnormal phenomenon occurs all over the world. Later on, Don Thousand and Vector initiated their machination, sending many Barian "Numbers" they designed to corrupt the populace of Earth, as they were to be sacrificed so that Barian World can be merged with Earth via Fusionizers. When Yuma returned from Astral World, he started a Duel with Mr. Heartland, who harmed Kite using the "Number" he obtained from Scritch. Mr. Heartland used his "Number 1" and transformed himself into a demonic humanoid, depleting Yuma's points rapidly. However, Yuma and Astral merged into "ZEXAL III" and defeated Mr. Heartland, making "Numbers" Vector and Don Thousand created to be destroyed. With the Earth and Barian World merging together, the Seven Barian Emperors began the final battle of the Interdimensional War with Yuma Tsukumo and his allies. In the past there was Original Dimension, also known as the United World, is a dimension that became split into Four Dimensions. A colorful and futuristic city, it has hovering vehicles and virtual birds while sharing many general similarities to the Fusion, Synchro, Xyz and Standard Dimension's architectural structures. It is also the birth place of the ARC System technology. At some point, much of it was destroyed by Zarc using his fused Dragon form. 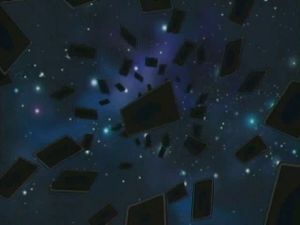 At a later point, Ray Akaba opposed the Supreme Dragon King Zarc by using four cards to defeat him which caused them and the Dimension to split into four. ↑ 1.0 1.1 Yu-Gi-Oh! GX episode 155: "Return of the Supreme King, Part 3"
↑ Yu-Gi-Oh! episode 177: "A Duel with Dartz - Part 1"
↑ 3.0 3.1 3.2 Yu-Gi-Oh! GX episode 177: "Combo of Terror! "Zero and Infinity""
↑ Yu-Gi-Oh! episode 180: "A Duel with Dartz - Part 4"
↑ Yu-Gi-Oh! ZEXAL episode 25: "Frozen in Time"
↑ Yu-Gi-Oh! ZEXAL episode 110: "A World of Chaos: Part 1"
This page was last edited on 20 July 2017, at 11:19.